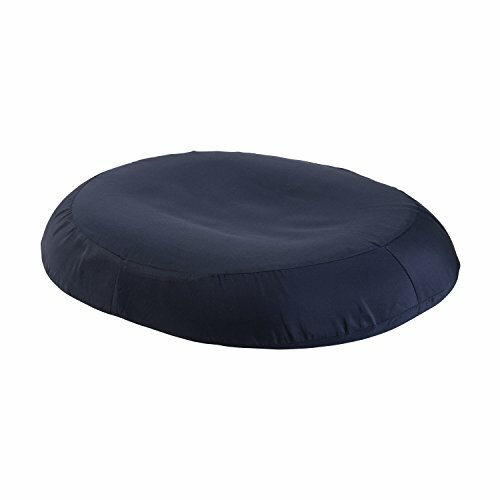 If you’re looking to reduce the pressure on your back or tailbone while sitting for extended periods, especially on hard chairs, this cushion will provide welcome relief. Made of high-density foam that retains its shape, the cushion will mold to your body contours, giving you comfort and support. Due to its ring shape design, it’s also helpful for women healing after childbirth or for those who suffer from hemorrhoids. Yet it’s discreet! The hole in the center is cleverly hidden by fabric so you can take it anywhere. It’s ideal to use in the home, office or car. The Duro-Med Molded Foam Ring Cushion also makes a great travel pillow for your car or truck. Help ease the pain that comes from long trips or even your daily commute by sitting on this supportive cushion. Those with lower back pain or tailbone pain will find it especially helpful while on the road or when traveling in trains or planes.